27 February 2013: Malvern, UK: Leading technologists from Malvern Instruments, the materials characterization experts, will be presenting at Powtech (23-25 April, Nürnberg, Germany). Dr Alan Rawle, a highly-respected figure in the field of light scattering will present “Attrition of FCC catalysts studied by pressure size titration (PST) in laser diffraction dry dispersion” while Dr Debbie Huck, an authority on imaging, will present “Component specific particle characterization of particulate-based products.” Look out too for live instrument demos throughout the 3 days and networking events around Partec. Dr Rawle’s presentation is part of the Partec conference schedule for Tuesday 23rd April and will take place at 15.20 p.m. He will examine how the latest, highly controllable dry dispersion engines for laser diffraction analysis can be used to quantify the strength of particulates and their propensity to undergo attrition, for example, when fluidized. Dr Huck’s Partec presentation is planned for Wednesday the 24th at 14.40 p.m and will focus on the capabilities on the Morphologi G3-ID, an instrument that combines automated imaging technology with Raman spectroscopy to provide size, shape and chemical identity measurement in a single system. Her focus will be what can be achieved with the new technology and the applications where this brings real value. 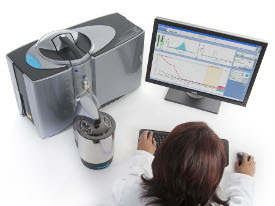 On display on the Malvern stand will be the new Zetasizer Nano ZSP, the premium performance system for particle size, zeta potential, molecular weight and protein mobility measurement, and the application of microrheology. Laser diffraction particle sizing instrumentation will represented by the Mastersizer 3000, the latest generation of the world renowned Mastersizer range, and the Insitec, a process analyzer for real-time monitoring. Last but not least visitors will be able to view the Morphologi G3, and learn how it is being combined with Raman spectroscopy to extend analytical capabilities (Morphologi G3-ID).